A homeless heroin addict attempts to reunite with her troubled boyfriend. Arielle Holmes was introduced to drugs as a 12-year-old, smoking crack with her mother in their New Jersey home. By 17, she was addicted to heroin, and living on the streets of New York City. Holmes documented her unenviable life through a journal and sketches of the city, which caught the attention of filmmaking brothers Ben and Joshua Safdie. The pair worked with Holmes to adapt her memoirs loosely into a screenplay, casting the young woman in the story of her life. The result, Heaven Knows What, is arguably the most realistic depiction of drug addiction found outside of a straight up documentary. We're introduced to Holmes at one of her lowest points, slashing her wrist in a misguided attempt to prove her love for her narcissistic fellow junkie boyfriend Ilya (Caleb Landry-Jones), who promptly flees the scene. Leaving hospital, Holmes returns to the streets, falling in with Mike (Buddy Duress), a drug dealer with a penchant for sampling his own goods. The film follows Holmes over the next few days as she maintains her routine of spending her days scrounging for loose change, and her nights trading her earnings for sticks of heroin, all the while attempting to ingratiate herself back into the affections of the cold and cruel Ilya. The Safdies' film is a refreshingly honest take on the lives of the under-privileged. Their camera, often hidden to capture genuine reactions from members of the public who stumble onto what they assume are real life vagrants, merely observes their characters, never judging. Though in reality the filmmakers could be said to have 'saved' Holmes, in their movie there are no such sober saviours. Instead, Holmes' fellow addicts look out for her, with Mike lecturing the teen on how Ilya is dragging her down. Like any stubborn teenage girl, she refuses to listen; she claim she's in love with Ilya, and though his appeal will elude viewers, we believe her statement. In many ways, Heaven Knows What resembles a chilly East Coast cousin of Sean Baker's sunkissed drama of LA streetwalkers, Tangerine, spending its running time solely in the company of characters most of us cross streets to avoid in real life. It's the very lack of moral judgment that endears these people to us, along with the verisimilitude of the performances. Holmes, also seen as a member of the magazine crew in Andrea Arnold's American Honey, is heartbreaking as a tough beyond her years teen whose innocence never lets us forget just how young she is. If there's a weak link, it's Landry-Jones, who stands out as a professional actor playing a role he hasn't lived when set against the likes of the outstanding unknown amateur Dupree, whose Mike is a character that lights up every scene with his sweet charisma. Since shooting the film, Dupree has spent time in New York's Rikers Island prison, but viewers can see him in a couple of upcoming movies, including the Safdies' next project, crime drama Good Time. With no happy ending and a steadfast refusal by the filmmakers to provide any subjective commentary on their characters' life choices, Heaven Knows What may prove a shock to the system of viewers whose only experience of screen depictions of the destitute and drug-addicted comes from the sort of vanity projects in which Hollywood stars patronise the subject. But anyone who has ever known characters like Arielle and Mike, if only for as much as an overheard conversation on a bus ride, will find themselves nodding in recognition throughout. We hear much talk of the need for diversity in cinema, and that also needs to include social class as much as gender and race. Everyone deserves to tell their story. Holmes was exceptionally lucky to be offered a chance to tell hers, and we're equally gifted by the opportunity to watch it play out with such unflinching authenticity. 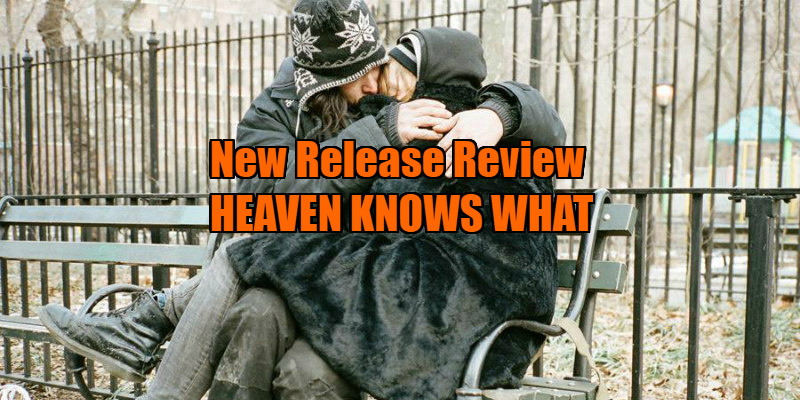 Heaven Knows What is available on DVD and blu-ray January 23rd.